I made a cover for my journal and I’m pretty proud of it. 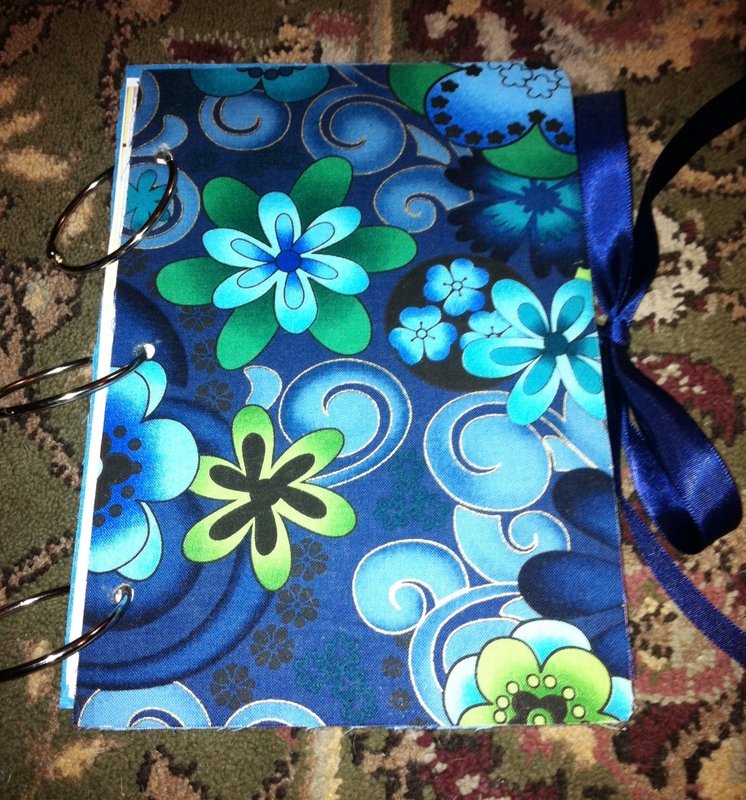 My journal that I planned to keep for the year of 2012 is made up of loose pages (half a 8.5 x 11 in. 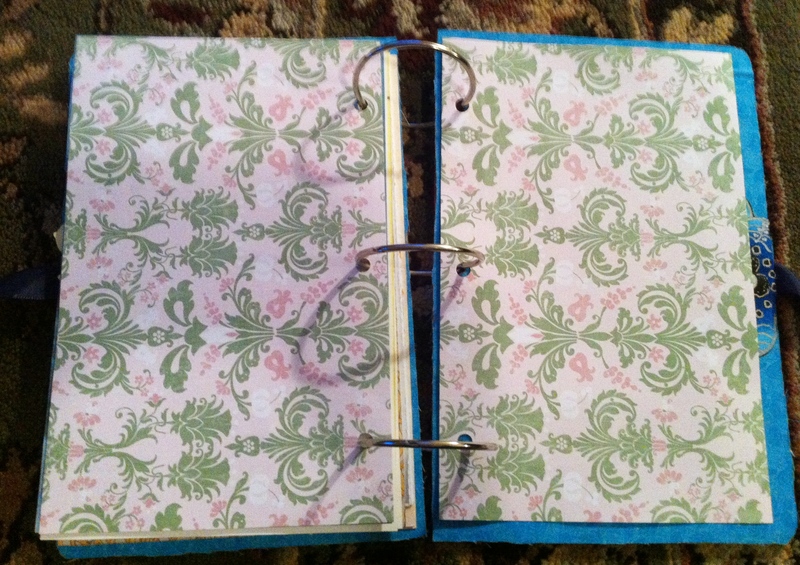 sheet / page) put together with loose binder rings. The rings are huge so I will have a lot of room for a whole year of pages. I had planned to make the covers from old manila folders and I had them cut out but they were too just too flimsy. I ended up recycling a priority flat rate box I got something in. I cut out the pieces that are just a little bigger than my pages and sprayed them with spray adhesive. I then took a piece of fabric that I had cut a little bigger than the cardboard and smoothed it onto the cardboard with an old credit card. 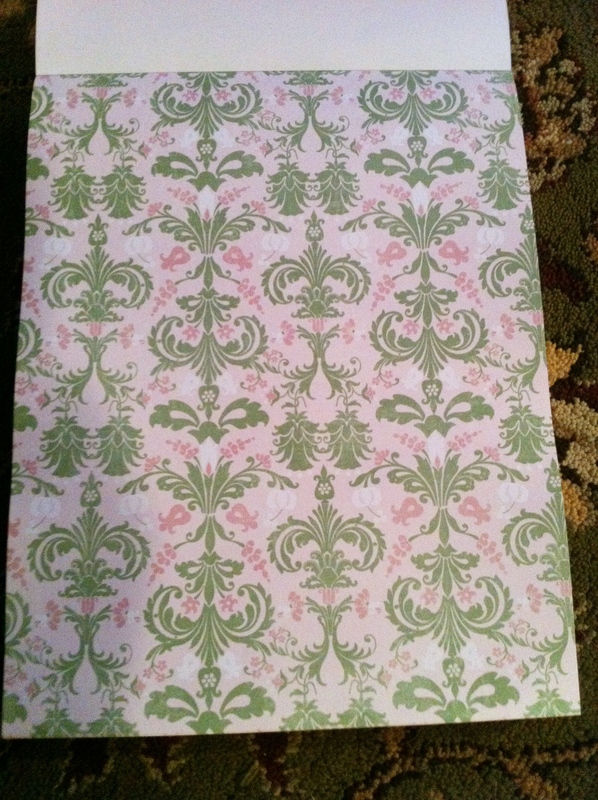 I just used fat quarters. They really aren’t very fat. Once I had that done I trimmed the edges of the fabric with scissors. I repeated that on the other side with a contrasting color fabric. One thing I learned was it is good to have a bunch of loose newspaper handy so you can spray the pieces and than quickly slide a new sheet under them so you’re not working on a sticky surface. You don’t want adhesive on the wrong side of the fabric. Then I punched the holes with a hole punch. Of course all I had was a regular paper hole punch and that was really hard to use to punch through cardboard with fabric on both sides. It eventually worked though. I’m going to have to find a heavy duty punch I can use because that was really hard on my hands. 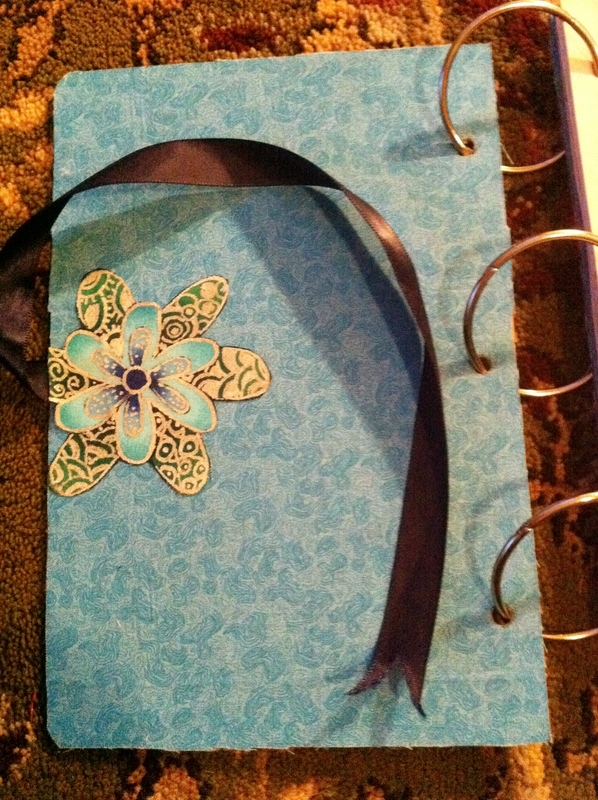 I decided I wanted my journal to have a ribbon to tie it closed so I cut too pieces of ribbon and used a hot glue gun to attach it. I laid my credit card down flat over the ribbon that was still hot with glue under it and pressed it flat. Then I used the edges of the card to scrap off the excess glue. I cut two flowers out of the fabric to adhere over the end of the ribbon and sprayed them with the spray adhesive. It keeps the edges of the fabric from fraying too. I let the flowers overlap the edges a bit and trimmed off the overhanging fabric. And, just because I like to doodle, I did some zentangle designs on my flowers with a silver Sharpie paint pen. 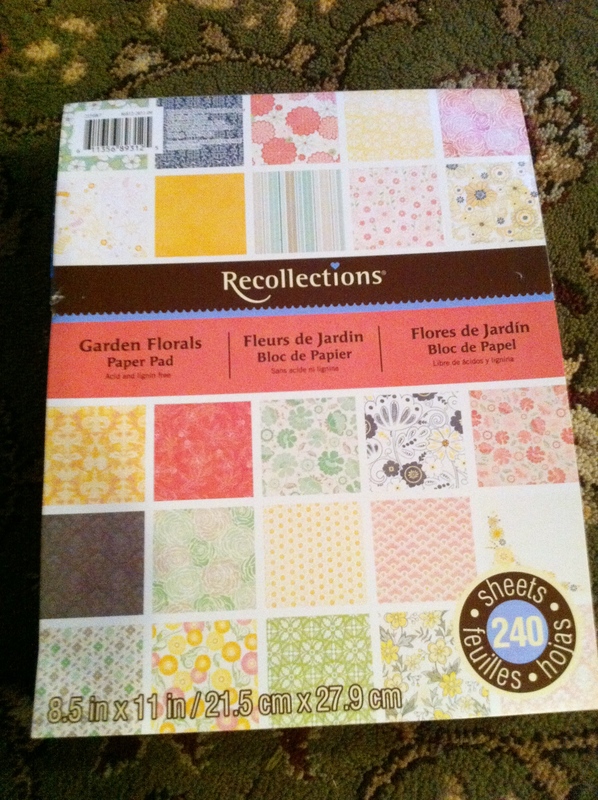 I found this big book of 8.5 x 11 inch scrapbook pages at Michael’s and now I just need to cut them in half to fill my journal with pages to work on. 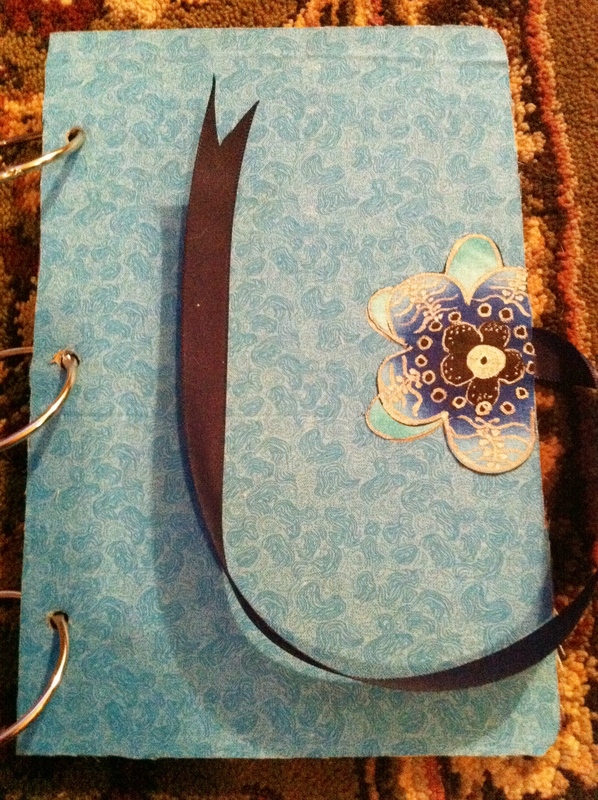 I have a piece of cardstock that I use as a template for where to punch the holes in my pages. 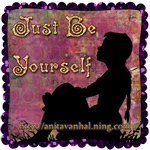 This is the journal I’m using for my SOAR Journal which is a free class at Just be Yourself. It’s not too late to sign up. 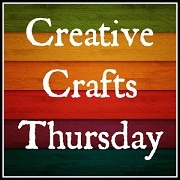 It is a great healing class if you have things that have been troubling you. If not. it just gives things to think about and prompts to help you think of something to write. 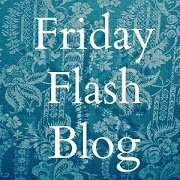 They also provide a lot of great graphics for using in your journal. So now I just need to cut several more pages in half for pages to journal on so I’m ready anytime I want to use it. I’ll have something to journal about the next few days because my husband is treating me to a manicure and pedicure and a haircut for Valentine’s Day! We are going to have a lot of fun. He has the next two days off! This really is turning out so pretty! Nice work, lady!